BEIJING: China said on Friday it was willing to have more discussions with all parties concerned including India on blacklisting the head of Pakistan-based militant group Jaish-e-Mohammed (JeM), which claimed responsibility for the attack on an Indian paramilitary convoy in disputed Kashmir in February, report agencies. 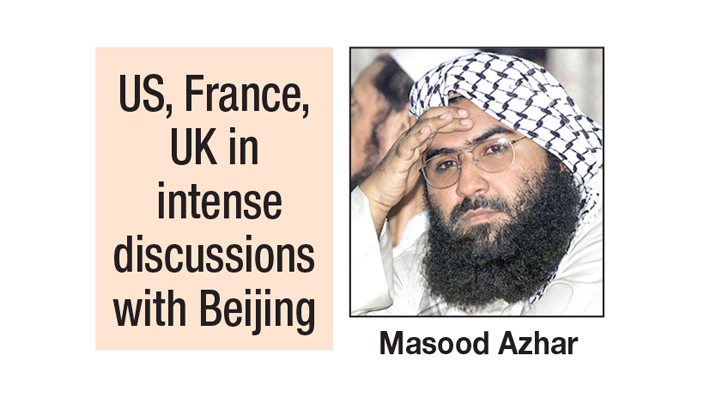 Meanwhile, the US, France and the UK are believed to be in intense “good faith” discussions with China to arrive at a “compromise”, including on the language on the UN designation of Pakistan-based Jaish-e-Mohammed chief Masood Azhar as a global terrorist, according to people familiar with the matter. The proposal to designate Azhar under the 1267 Al Qaeda Sanctions Committee of the UN Security Council was moved by France, the UK and the US on February 27, days after a suicide bomber of the JeM killed 44 CRPF soldiers in Jammu and Kashmir’s Pulwama, leading to a flare-up in tensions between India and Pakistan.